Australia's most versatile power stripper/scrubber. It has 51cm (20.1") pass width. It has removable weight system ideal for heavy-duty floor cutbacks; concrete floor scrubbing, etc. All-Australian designed and built. 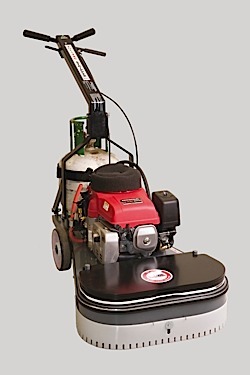 It has Honda 9.69kw (13hp) 4 stroke motor, push button start, up-to-the-wall stripping/scrubbing, 3 Quick Release Tynex abrasive brushes, pad speed of 350 - 700 rpm, battery of 12 volt, 20 amp hour, gel sealed and weight including weight set of 160kg. Parts available all over Australia. Warranty - 1 year on motor and parts.